State of the nation - when is a strike illegal? It seems every other week the commute to work or the weekly shop is hampered by a strike or two. So what is the legal basis for strikes in Ireland and when is it illegal? The relevant legislation is the Industrial Relations Act 1990. This provides immunity from prosecution or legal action for persons involved in industrial action regarding a trade dispute. It is not a right to strike but a right not to be prosecuted. There is no absolute right to strike in Ireland. To be a legal form of industrial action, certain procedures must be followed. Striking or picketing is a common form of industrial action. For a strike or picket to be legal it must be carried out in contemplation or furtherance of a trade dispute, for the purpose of peaceably obtaining or communicating information, or for the purpose of peacefully persuading a person to work or abstain from work. Those are the only circumstances. To convince someone not to shop somewhere or not to use a particular company does not fall under any of these headings. - the terms or conditions of employment of any person. A secret ballot must also be carried out prior to the industrial action taking place. All members of the union must be entitled to vote. The secret ballot and its results will basically become the authority for the union to organise the relevant action. There are two types of picketing - primary and secondary. Generally workers can only picket at their own place of work otherwise they risk losing the immunity from legal action that the Industrial Relations Act 1990 provides. This is primary picketing. There are some exemptions to this including provision for secondary picketing. Secondary picketing occurs when workers picket at a premises other than their place of work and involving a company with whom they do not have a trade dispute. This could include the situation where Bus Éireann workers picket Irish Rail and Dublin Bus depots as happened last week. However, like with primary picketing, there are certain conditions that must be complied with in order for secondary picketing to be lawful. It is only lawful if the workers carrying out the action have a reasonable belief that the company they are picketing is assisting their employer directly in frustrating or avoiding resolution of the trade dispute in question. It is also the case that the primary picketing would have to be lawful in the first place for the secondary picketing to have any chance at being lawful. If picketing is not peaceful or is carried out to persuade someone to do something other than attend for work it will be unlawful. - that they secondary picketing was based on a reasonable belief that the other company was directly assisting the original employer in frustrating the industrial action. The normal manner in which illegal strikes are dealt with is by way of injunction to the High Court to stop the action from continuing. There may also be further fallout from an illegal strike leading to individual disciplinary action for those employees involved. Criminal sanctions are also possible for trespass. 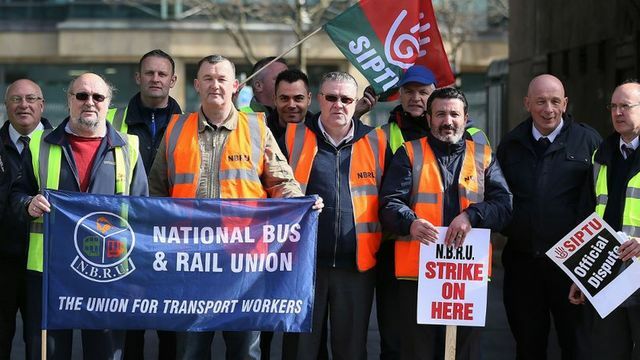 The current status of the most recent strike action in Ireland is that talks between the union and Bus Éireann management are set to continue in the Workplace Relations Commission. The strike has continued for 2 weeks. Hopefully an end is in sight! Earlier, talks aimed at resolving the Bus Éireann dispute at the Workplace Relations Commission adjourned until tomorrow morning, with no sign of a breakthrough. Unions and management will meet tomorrow at 11am. Participants had negotiated right through the night in an attempt to move forward but sources at the talks said progress was very slow and while some tentative agreement was reached over improved efficiencies at the company, changes to pay structures sought by management remain a major stumbling block. There was no comment from management representatives as they left the WRC today.